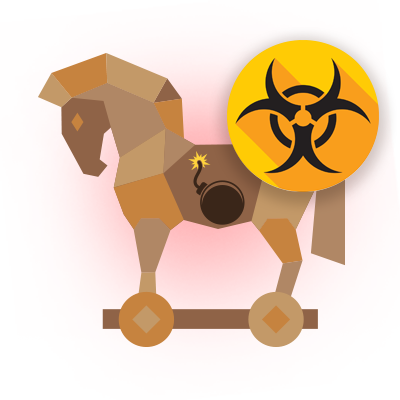 What is the Trojan Horse Virus? The peace-offering gift that made the Greeks win the war against the Trojans is no other than the Trojan Horse. It continues its legacy in the Information Technology. It's now used as one of the most threatening cyber threats on the Internet. A Trojan horse virus works as a delivery service to the harm it carries. It can perform a specific task that the cyber criminal designed it to execute. Of course, the victim wouldn't know about the threat because the Trojan horse virus is disguised as a legitimate program. It can show up useful and friendly but it only does harm to their system. The usual Trojan horse virus is presented to be useful to many unassuming users. For an instance, a friend might have sent an email with an attachment. The user will expect that it's something important and download it. They'll open the file and there the problem starts. Cyber criminals created plenty of Trojan horse virus options to choose from. Knowing the vulnerabilities in the computer can save time and damages. The users need to know where the programs and files they're receiving are reliable. Most antivirus can't detect Trojan horse virus on the system. Even Trojan horse virus are dangerous, they still use ordinary DOS/Windows commands. Any attempt to trigger an alert on these commands would result in great false alarms. It contains data or code that abuses a vulnerability within application software that’s operating on your endpoint. It gives malicious users remote access over the infected computer. They can do whatever they want such as sending, receiving, launching and deleting files, displaying data and rebooting the endpoint. These are designed to hide certain objects or activities in your system. This can effectively prevent malicious programs being detected. Its purpose is to steal your account data for online banking systems, e-payment systems and credit or debit cards. This Trojan horse virus can start up the Denial of Service (DoS) attacks. Not only it can affect endpoints, but also websites. By sending multiple requests – from your computer and several other infected computers – the attack can overload the target address which leads to a denial of service. This is used to install Trojans and other viruses into the computer. This can also conceal detection of malicious programs. If you're using a weak or outdated antivirus, some of them can't scan all of the components inside this type of Trojan horse virus. Use a firewall. Firewalls block unwanted connections, which can help prevent Trojan horse viruses. You must secure your computer with an anti-virus software or anti-spyware software. You should also keep them updated always. You should always keep your security patches up-to-date for your operating system. You must observe caution when opening email attachments, clicking on unfamiliar links, downloading and installing certain programs from publishers that you don't trust and visiting strange websites as some of these attachments, links, programs or websites could be Trojans that contain viruses. Trojan horse virus is undeniably hard to spot on. Even ordinary antivirus might not be able to track the nasty fake programs on an ordinary user's computer.